Since your ISP or email provider probably uses some type of spam filter, we ask that you add us to your trusted list of senders or contacts. This is known as whitelisting. AOL: To make sure our email is delivered to your Inbox, you must add our email address or corporate domain to your Address Book or Custom Sender List. When the "Mail & Spam Controls" box appears, click "Custom sender list"
Add TheSignChef.com, then click "Add"
AOL Web Mail: If you use AOL Web Mail, replying to an email from TheSignChef.com will also work. Email from our domain will now appear in your Inbox. If you see mail from TheSignChef.com, highlight it and click "Not Spam"
This does not guarantee that our email will be delivered in the future, but it does help. Create a filter to automatically send our email to your Inbox. This is the only way to ensure delivery. Hotmail, Windows Live and MSN: In Hotmail, you must "Mark sender as safe.” Entering an email contact in the Address Book or Contacts no longer whitelists the sender. 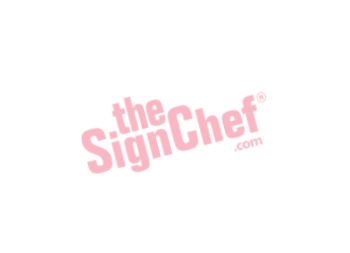 If you see an email from TheSignChef.com in the folder, click "Mark as safe"
Under "Junk email," click "Safe and blocked senders"
Gmail: To make sure our email is delivered to your Inbox, you must add the email address @thesignchef.com to your Contacts list. Click "Add TheSignChef.com to Contacts List"
Choose "Change automatic download settings"
Choose "Add the domain to the safe sender list"
If you have Spam Blocker turned on, suspect messages are automatically sent to your Suspect Email folder if the domain is not in your Address Book. SpamAssassin: Add the following entry to your user_prefs file, which is found in the .spamassassin subdirectory on your web/mail server: whitelist_from @thesignchef.com. Save the user_prefs file or move the updated copy to your .spamassassin subdirectory. If you have no user_prefs file in this subdirectory, create one. Click “Filters” in the sidebar. Click “Add to Whitelist” from the menu. All Other Spam Filters Not List Above: If email from TheSignChef.com is being blocked, try adding @thesignchef.com to your Address Book or Contact list. If emails continue to appear in your Junk folder, contact Customer Service or your IT Department.